First things first, I love how you get a spatula with this! I use this to scoop and spread the mask onto my face. You only need a little bit to create a thin layer, meaning each tub will last you ages considering it is a small tub. The texture is creamy and thick but can be easily spread. There is a slight cooling feel soothing any redness I may have and the mask will feel a tad tighter as it dries as expected with clay masks but not too stiff. Oily skin people, you will love this mask. I have used this before bed and the mask had soaked up the excess oil and exfoliated the skin, leaving me with soft, brighter, fresher look and feel after the first use without drying it. The next morning, my skin wasn’t oily for a change. I use this once a week, sometimes twice a week if I have time. I could see it bringing up any impurities, within the spots, up to the surface of the skin. This helped some spots heal quicker than usual and has helped me from future break outs. Haven’t seen any blackhead reduction yet, as well as pore sizes but my pore sizes aren’t big. It states to roll the mask when it’s fully dried with lukewarm water but I find that messy so I had to use a face towel instead. Much easier. I wouldn’t recommend this it non oily skinned users. It would most likely irritate you. There is no scent to this if you are sensitive to heavy scents. It’s free from artificial pigments, ethanol, animal ingredients, and mineral oil. Hopefully I can see more results in the future with this. I definitely recommend this and I would repurchase it in bulk whenever I’m next in Hong Kong. The tub I have is 100ml but there is a 200ml tub I believe. But for now, I will have to order it online somewhere. Do you have any favourite clay masks? Oh gosh, this mask sounds right up my street. 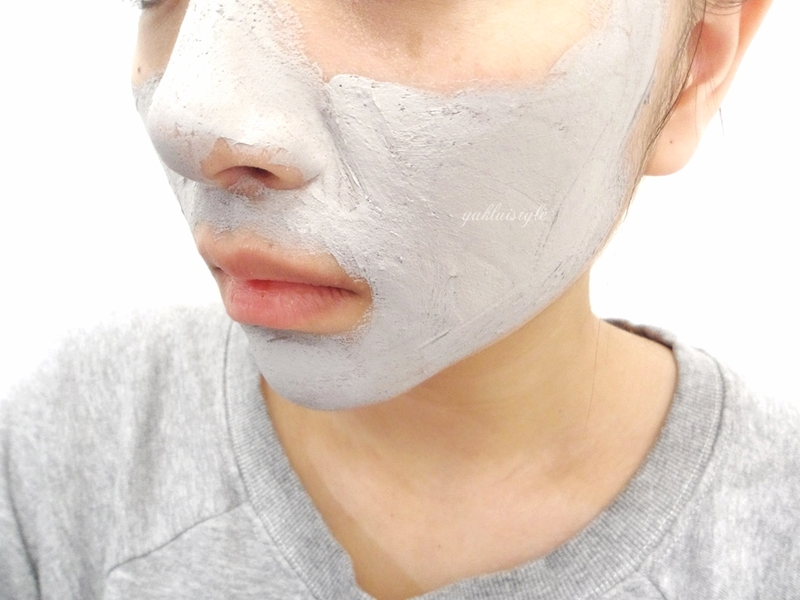 Think the only volcanic clay mask I used was by MAC and I LOVED.IT. Been looking to try a new clay mask and this might be the one. Thanks for sharing! I love that this masque comes with a spatula! Means your hands stay clean while you're goo-ing up! I have such oily skin, definitely trying this! This looks so cool, I hate messy face mask fingers so a scoop is perfect! I don't have oily skin though so I'll not try it, sad! I have not used a volcanic clay mask ever but I must say – the name alone gives me the impression that it's an effective skin care product. 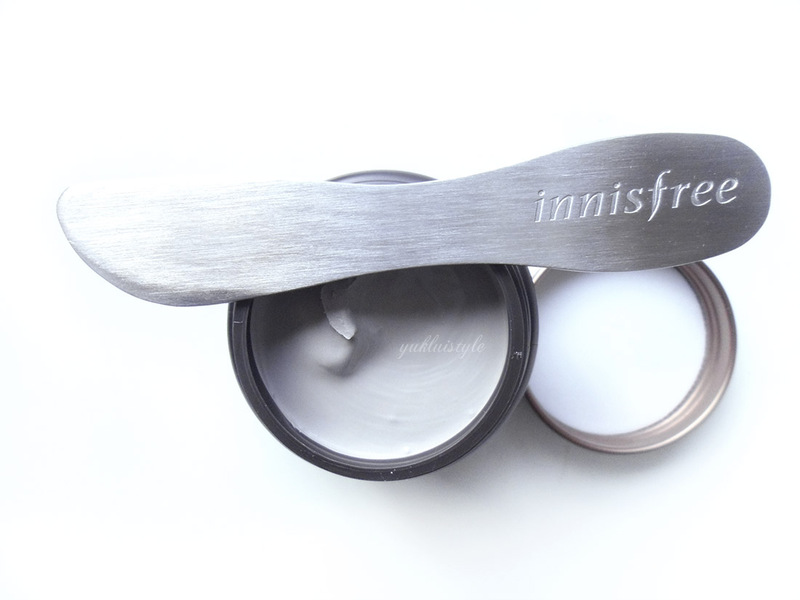 I like that Innisfree comes with a spatula, lol. It's also good that it doesn't have any scent, it makes the product even better. The spatula is such a great idea, and it's nice to know it's smooth.. some clay masks are so chunky! I love face masks! The idea of the spatula is great, I never thought of that before! This mask sounds great, I love my glamglow mask, the spatula is a great idea. Another for the girls post. But I must the spatula thing is great. I've heard so much raves about innisfree it makes me feel eager to try it out! 🙂 I like those masks from ORIGINS too! Of course, this is a "for-the-girls" post, but this has me curious. In your experience, is the price of HK$120 reasonable for 100 ml? Awesome review! 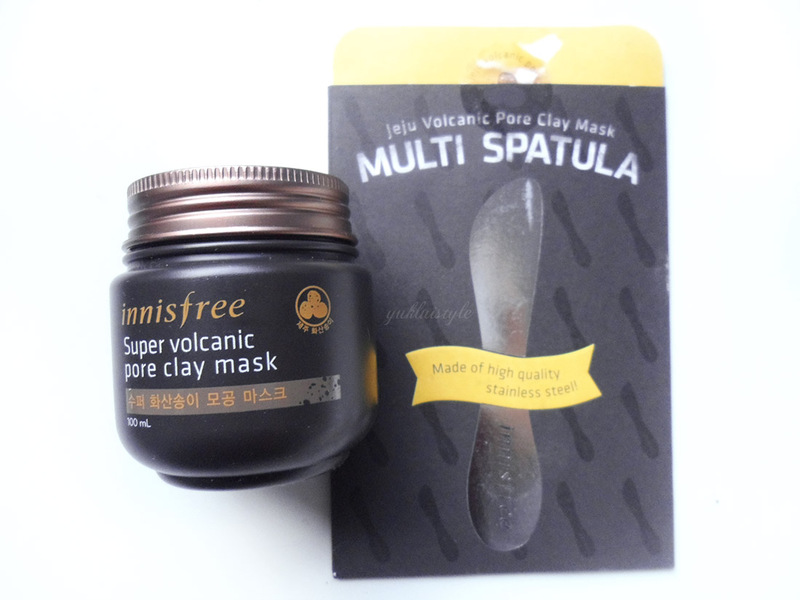 I use the regular Innisfree pore clay mask, which works great for my skin type, but I'll make sure to recommend this to my mom, who has very oily skin. The packaging looks very elegant and that it comes with a spatula. Though I kind of find it quite pricey.